Photo Courtesy : NFL.com. 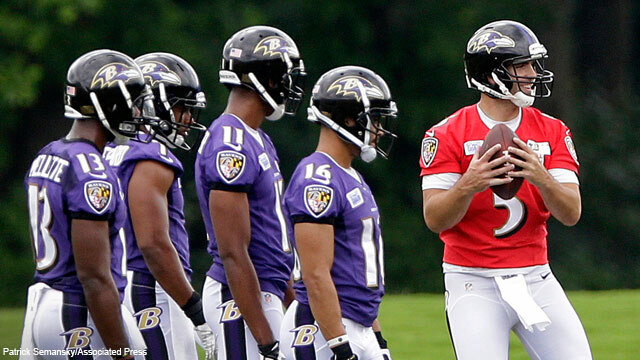 From left to right – Aaron Mellette, Gerrard Sheppard, Tommy Streeter, David Reed, Joe Flacco(obviously). Like most off-seasons, this one has been filled with plenty of rumors and speculation. How is player X going to replace player Y? How will the coaches use this guy or that guy? Is this player ready to step up and meet expectations? Quite the busy off-season for the Ravens and the player turnover has sparked a lot of questions. Here are just a few questions I would like to have answered this preseason, with some more questions to come as camp rolls on. Add your questions and your thoughts on our message board. A quick note, I realize the biggest questions involve the new offense under Jim Caldwell who has had a full offseason to make the playbook his. Formations, how they’ll use Pitta and Dickson, if Jacoby Jones is bigger part of the offense. Fact is, teams won’t likely divulge too much of their playbook in the preseason. So I think we’ll see some very vanilla looks this preseason, saving some formations and assignments for when it counts. 1. Can Matt Elam and Arthur Brown run with the first team? We’ve been speaking about this pair of rookies since draft day as if they are going to walk right into a starting role in week 1, with the departures of Bernard Pollard and Ray Lewis respectively. We need to take a step back and realize that a starting role is this team will be earned, especially for rookies. James Ihedigbo and Albert McClellan worked with the first team to kickoff camp. I would expect the same in PS games one and probably two. The rookies will get more reps in those games on the second team. We’ll see if they run with the first team in game three, where the first team plays up to three quarters. If these guys are not starting come Week 1 in Denver, more questions will surface. 2. Is Jimmy Smith capable of #2 CB? Smith needs to play and be challenged this preseason. The Ravens 2011 first round pick hasn’t played a full season to this point. Injuries have held him back. It’s a big question mark moving forward whether or not Jimmy Smith can be counted on to start on this team. He made a good showing this past postseason. Smith was getting used on sure passing downs opposite Cary Williams when fellow CB Corey Graham would shift into the nickel. With Williams gone, Smith will be in line to start opposite Lardarius Webb as Webb returns from injury. It’s time that Jimmy Smith stays healthy, and lives up to that first round pick billing. I want to see him get ample playing time in the preseason, and I want to see him get challenged often. The best gauge of where Smith is in his progress would be PS game two against the Falcons. Running with the first team, he could be lined up with either Roddy White or Julio Jones for four or five drives. 3. How will the Ravens use Kyle Juszczyk? Selecting him in the fourth round definitely raised some eyebrows in Baltimore. At that point it seemed the writing was on the wall for Vonta Leach. If the rumors are true and Vonta Leach returns to Baltimore, you have to think the Ravens were not going to waste a fourth round pick on a backup fullback. There has to be something more to this kid. The Harvard product showed excellent pass catching skills in college, and also “stoned every linebacker he faced” at this year’s Senior Bowl. Juszczyk’s size and ability to play downfield doesn’t make him your prototypical fullback which only adds to the intrigue surrounding him. Where do we see him line up? FB, split out to the TE position, or even into the slot? Will he be another reliable check down option for Joe Flacco? How well will he run block for Ray Rice and pass block for Flacco? I realize they won’t divulge much of the offensive playbook. But in this case, Juszczyk as a rookie will see more time on the field than others on the offense. They know what they got ability wise with Joe Flacco, Torrey Smith, Dennis Pitta, Ray Rice, etc… The Ravens have to see what Juszczyk brings to the table. He’ll have to show us something.